Allie Ehlers tries to dribble past a Grand Valley defender Tuesday at Woodbury Sports Complex. Ehlers scored both goals for Moffat County in a 4-2 defeat. 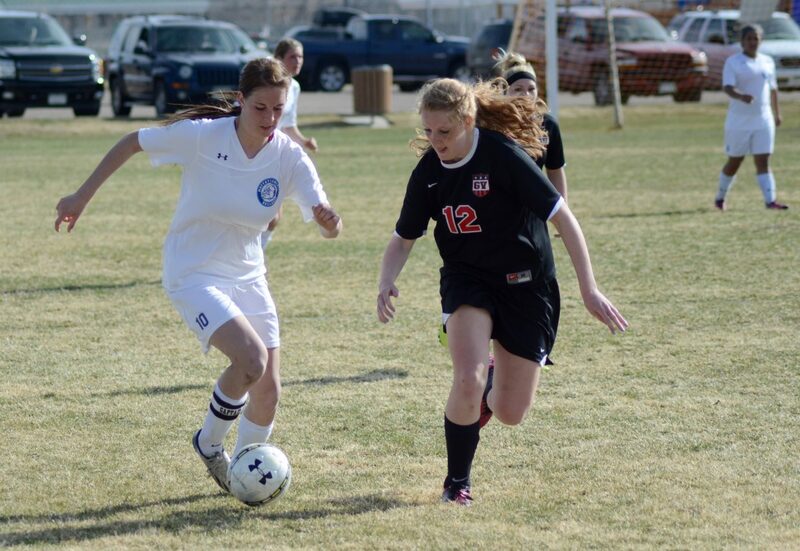 Moffat County’s girls soccer team played a tough game Tuesday but was unable to continue its winning streak in its first game back from spring break. Hosting Grand Valley in a rescheduled game from before break, the Bulldogs were first on the board but couldn’t avoid quick responses from a Cardinals team that looked a bit sharper in a 4-2 win. Allie Ehlers started by scoring 10 minutes into the game on a shot from distance that she looped in above the keeper’s head. The goal came right after Ehlers missed a similar attempt on a free kick. In the action of the game, she gave Moffat County the lead. But Grand Valley’s Randi Sheridan came back with an equalizing goal just a couple minutes later, as a botched clearance kick came straight to the senior, who carried it into the box and struck it past Hannah Walker with a defender running alongside her. Just 90 seconds later, defender Delaney Baker slipped and landed on top of the ball inside the six-yard box. When she stood up, it gave Ashlynn Speakman a free look at goal from just feet away, which she finished off for a 2-1 lead. Grand Valley owned possession in the first half and proved the aggressors for much of it, but Moffat County came out and matched the other team’s energy in the second half. Ciesco had a strike sail inches over the crossbar, and the Bulldogs began to create more chances on offense. Eventually Ehlers broke through again, this time on a free kick. Instead of the arcing shot she typically tries, the senior shot a line drive that ricocheted off a Grand Valley defender and into the net to tie it up with 24 minutes left. It didn’t stay tied for long, however. After significant pressure on the Moffat County defense, Speakman received a throw-in, turned to her left and put an impressive strike into the far corner to make it 3-2. Hannah Walker was impressive in goal for the Bulldogs, stepping out to shut down several Grand Valley threats and making a few nice saves in front of the net as well. The teams will play again in just two days, with Grand Valley hosting the Bulldogs in Parachute.